Watching a huge Tesla coil in action is visually stunning, but one person has been using his own Tesla coil for over four decades to produce something else just as eye catching. Dave Archer uses a Tesla coil made by Bill Wysock to create amazing astronomical glass paintings, a technique Archer coined as "electric painting". The results are out of this world. Archer uses a handheld "brush" powered with one million volts of electricity to both energize and influence water-based painted clouds on reverse glass. Reverse glass painting has been around since the Middle Ages, and consists of painting on one side, then viewing the image from the opposite side, looking through the glass at the image. But electric painting on reverse glass is a whole new art form. Archer has demonstrated the reverse glass electric painting technique on over two hundred television shows, yet the only video out there on the Web showing how it's done is the one on his own YouTube channel... and there's no sound. Still, it's pretty amazing just to watch. Well, except when you get to the talking parts. 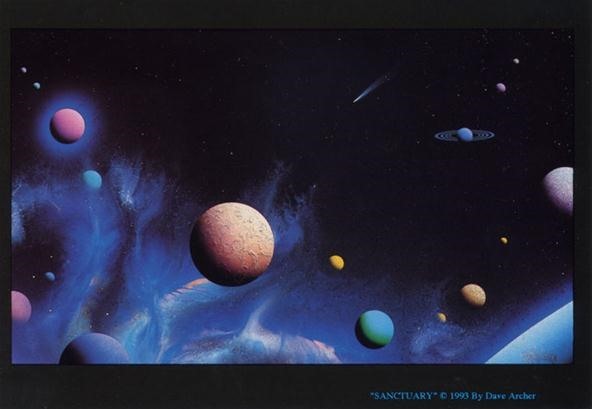 For a complete look at all of Archer's amazing paintings of planets and comets, including some of the space paintings that appeared in many Star Trek episodes and movies, check out his image gallery on hit website.